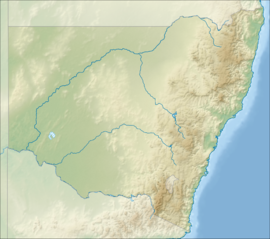 Newcastle is a city in New South Wales, Australia. It is also the second oldest city in Australia. Newcastle is 160km north of Sydney, and is the largest coal-harbour in the world. 500,000 people live in Newcastle making it second largest city in New South Wales. Newcastle was started in 1804 by Lieutenant Charles Menzies and was for convicts who mined the coal. It is named Newcastle after the English coal harbour of Newcastle-upon-Tyne. Newcastle has lots of things to do such as restaurants and food. ↑ Australian Bureau of Statistics (27 June 2017). "Newcastle (Urban Centre/Locality)". 2016 Census QuickStats. Retrieved 3 November 2017. ↑ 2.0 2.1 2.2 "Newcastle Nobbys Signal Station AWS". Climate statistics for Australian locations. Bureau of Meteorology. Retrieved 3 November 2017. This page was last changed on 9 April 2019, at 06:58.